Breakdancing has become popular in Israel over the last few years. Dvir Rozen has been a major influence on this pop culture phenomenon, by directing the Israel Breakdancing Association, and starting his own company, Street Art Productions. Recently, his crew performed a breakdance version of West Side Story at the Zoa Theater in Tel Aviv. With Rosh Hashanah only 16 days away, Rozen and his company have collaborated with the veteran outreach organization, Aish Hatorah, to produce a rousing Rosh Hashanah breakdance greeting. Headquartered in Jerusalem near the Western Wall, Aish.com is a division of Aish HaTorah, an apolitical network of Jewish educational centers in 35 branches on five continents. This partnership enables Aish.com users to experience the richness of community at an Aish branch. The video starts out in a yeshiva study hall and quickly moves into the streets of the old city of Jerusalem. Our first reaction was "are these really yeshiva boys breakdancing with black hats, black velvet yarmulkes flying off and tzitzit flapping in the wind?" 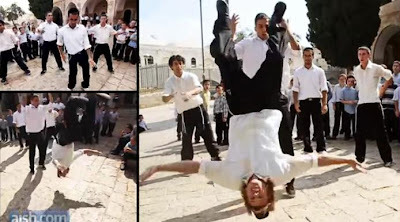 but we quickly realized that they were the professional breakdance group called Ariot Zion (Lions of Zion) led by Rozen himself, outfitted in yeshiva garb. The breakdancing phenomenon was reported on by Israel21c in the video that follows what Aish.com calls its Rosh Hashanah Rock Anthem. Enjoy!